TRIUMPH OF THE WILL: The Stylish And Horrific Mechanics Of Manipulation – Schlockmania! Triumph Of The Will has become synonymous with propaganda, representing to many the defining celluloid version of this concept. As Roy Frumkes points out in his liner notes for the recent Synapse blu-ray release of this film, its stylistic tricks have been borrowed for everything from political commercials to Star Wars. Over eighty years after the fact, it remains one of the most important films ever made because it shows how even the cinematic medium can be manipulated to lend a beautiful style to the most horrific concepts imaginable. Triumph Of The Will was filmed at a 1934 rally for the Nazi Party in Nuremberg, Germany. It bypasses any sort of conventional narrative structure to offer an impressionistic portrait of the event. It is concerned with two things. The first is reveling in the iconography and pageantry of the Third Reich, showing off several parades and official functions full of crisp uniforms and precise marching. The other concern is chronicling the speeches of Hitler and his underlings as they make a passionate case for their leadership of Germany. Of course, the reality it presents was carefully manipulated at every level. Hitler wanted an “official record” of the early days of the Nazi party, one that would portray them in the most glowing terms possible. He found a diabolically gifted co-consipirator in Leni Riefenstahl, a filmmaker who was given the run of the ceremonies and a massive camera crew. Riefenstahl brings a breathtaking visual style to the film, making use of precise angles and gliding camerawork to present the carefully designed iconography of the Nazis in a hypnotic manner. She was also a pioneer in staging “real” events, getting massive groups of Nazi underlings to re-enact speeches, marches and processions for her cameras so she could perfect her coverage of these events. The end result is both beautiful and horrifying all at once. 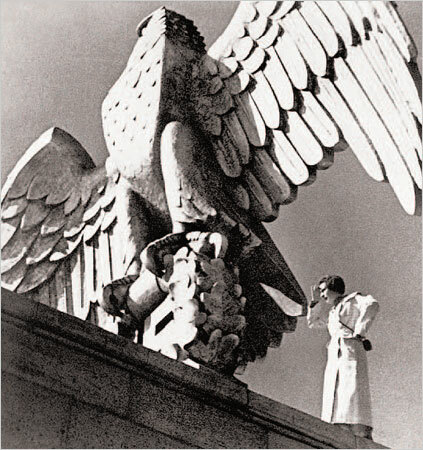 There is no denying the technical skill of Riefenstahl and her ability to use those skills to give her Nazi camera subjects an air of authority and grandeur. However, the knowledge of what Hitler and his disciples would do during the second World War brings a ghoulish quality to these proceedings: knowing the terrible crimes the Nazis would commit makes observing their self-worship in this film a grim process. The moral bankruptcy of Riefenstahl’s approach, treating Hitler like a god, only enhances that grim feeling. 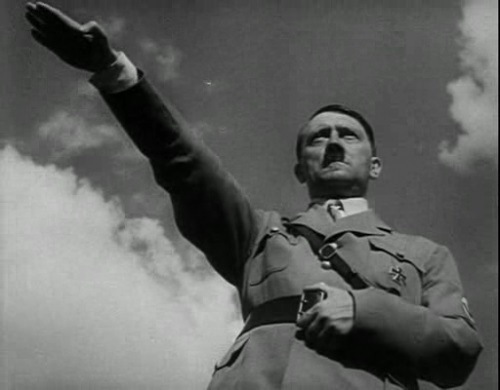 Thus, Triumph Of The Will is a piece of cinematic history that remains valuable on multiple levels: it’s a crash course in propaganda, a memorable record of how Hitler and his party saw themselves and a testament to how deceptive people can use art to manipulate reality to their own ends. If you want to understand how propaganda works on the big screen, this is where you start. 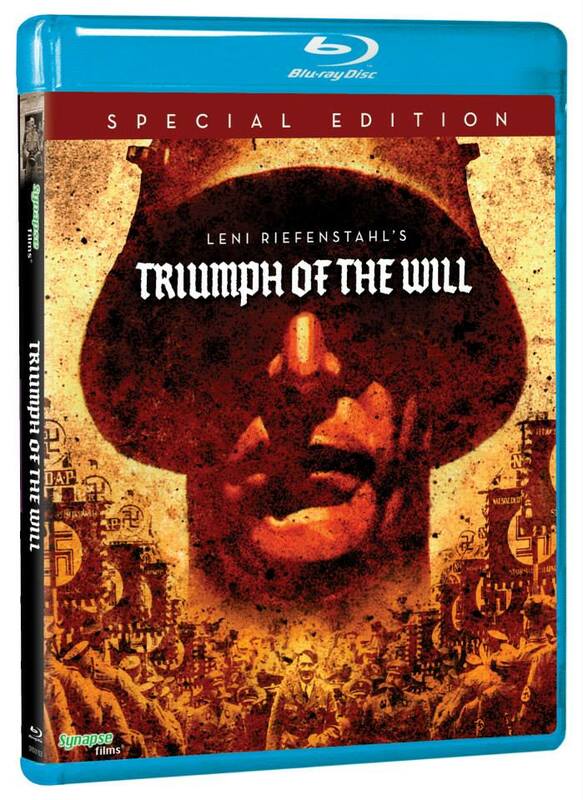 Blu-Ray Notes: Triumph Of The Will has long been a part of the Synapse Films library in DVD form and the company has recently revisited it for a blu-ray edition. The transfer is taken from a new 2K scan of a fine grain master, supervised by Robert A. Harris and captured at the original 1.19:1 aspect ratio. It looks stunning, bringing a new level of depth and clarity to the black-and-white photography while minimizing age-related damage. The lossless mono audio also impresses, offering a clear and well-defined rendition of the mix drawn from the original optical soundtrack of the fine-grain master. Optional English subtitles are available to accompany the speeches and they also include helpful identifcations for the Nazi officers shown in the film. The disc also includes an excellent, highly informative commentary track by historian Dr. Anthony R. Santoro. He’s able to provide context for Riefenstahl’s imagery, discussing every player in the Nazi party that appears onscreen and offering detailed info on their biographies as well as a history and analysis of the rally the film chronicles. It’s a great accompaniment to the film and a must-listen for history buffs. Also included is Day Of Freedom, a 17-minute short about the German army that Riefenstahl made after Triumph Of The Will. Hitler commissioned this film after the army complained about being underrepresented in Triumph Of The Will and it thus portrays German military might in the most worshipful and fetishized style imaginable, using the same bag of stylistic tricks that Triumph offered. Scenes of the military men enacting war games for a huge audience are chilling when one considers the real destruction that they would both create and suffer. The package is rounded by consise yet highly informative liner notes by filmmaker/critic Roy Frumkes that put Triumph Of The Will in its proper context as a film that is both influential and disturbing at once. In short, this is a great update of a historically important film from Synapse.